Thanks to the wonders of technology we managed to find the route, again from Walking Britain, on my mobile phone as we wanted a route that took in the whole of the Aran ridge. "Aran Fawddwy, which is only 9 metres (30 ft) short of being a member of the Welsh 3000s, is the highest peak in the Aran mountain range and the 16th highest summit in Wales. The other two Marilyns in this range are Glasgwm and Esgeiriau Gwynion. It is the highest British mountain south of Snowdon and is the principal summit of the predominant southwest-northeast ridge between Dolgellau and Bala, southern Snowdonia, a ridge that continues westwards as Cadair Idris." Which is we wanted to climb it, and to walk the length of the ridge, from Glasgwm at the South West end to Aran Benllyn in the North East. 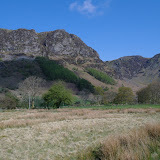 We'd headed off fairly early from the campsite just outside Dolgellau and arrived at the car park site at the end of the small road to Cywarch (SH853184) around 9am and, once again, the sun was shining and there was only a breath of wind in the air. It was however fairly cold so we started off with windproof layers on - a decision we regretted about 20 minutes later - and headed off back along the road towards the start of the footpath (which isn't at all signposted) that runs through Gesail farm before rising sharply on a zig-zag course up Cwm yr Ychen and on to the top of the plateau of Y Gribin (602m). It may not look it, but this path is seriously steep! It's quite hard to make out from the photo above but this path is very, very steep and a number of brief rest stops were required by both of us before we'd got anywhere near the top - it would seem that the sheep are far fitter than they look! The path is fairly easy going underfoot, due I suppose to its use by the farmer, and that made life easier than it could have been - the thought of climbing that on loose scree or slate is not a pleasant one. There are two trade off's to the slog up the side of this hill - the view and the fact that you gain around 450m of vertical height from the start point at the car park in a fairly short distance. Unfortunately the going doesn't really "get easy" and this walk isn't one for tired legs or a lack of willpower! Once on the top of the plateau we stopped to "review the map" and have quick energy snack before heading off along the fence line with the rocky Craig Cywarch to our right. As the fence starts to fork off in a NW direction around Bwlch y Gesail we headed almost due north towards Llyn y Fign which lies at the base of Glasgwm and on reaching the lakeside the cairn at the summit was clearly visible. From the summit cairn you head off following the North Easterly course of the boundary fence down to cross a marked footpath which lies around 220m below you - it's slightly disheartening walking down the side of Glasgwm as you can see, both from the map and the ground in front of you, that you are going to have to gain all of the lost height and more on the ascent to Aran Fawddwy a few kilometers later. Sure enough, a few kilometers later, we were doing just that - huffing and puffing up the side of Aran Fawddwy, towards a lone sheep that seemed to be enjoying our struggles! I get the feeling we're being watched! The summit of Aran Fawddwy (905m) is fairly impressive but what is more amazing are the views from it. Even though the cloud had started to move in we still had views all the way across to Rhinog Fawr and the Cadair Idris range. We stopped for a while to admire the view and to eat a well earned lunch and although the coffee was apparently too strong for Donna's taste it warmed us both up. As we sat on the summit, in total silence, small flakes of snow started to drift down towards us, being blown in small eddies by the light breeze that had dropped to almost nothing. It's lovely to find a place, be it a hill, mountain or forest, that is so still and quiet and so untouched by people. There were a few other people on the summit (only 2 or 3 couples and a man reading his book!) but they were out of sight (and mind) and it was like having the whole mountain to ourselves - a stunning moment and one that you don't get the chance to experience very often. Heading off from the summit we carried on along the fence line and well maintained path that drops slightly before rising again to the summit of Aran Benllyn - this section of the route is a "there and back" piece and isn't necessary but both of us wanted to get to the summit point and take in the views before back tracking and descending down the grassy slope of Erw y Ddafad-ddu which leads to the lake at the foot of Aran Fawddwy, Creiglyn Dyfi. From the lake we headed up along a broad ridge towards the summit of Foel Hafod-fynydd which allowed us to look back and take in the amazing view of the whole ridge line that we'd just walked along. Since photo's never really do these things justice I took a quick panoramic video on the NX10 camera - sorry about the wind noise! By now both of us were starting to feel a bit tired and the view down the valley and back up onto Drysgol wasn't filling either of us with too much joy - we had to descend around 250m down to the Llethnant river before climbing almost 300m back up the seemingly incredibly steep slopes of Drysgol before reaching the saddle between Drysgol and Gwan Lydan. On reaching the valley and river we decided to stop again for another snack and some more coffee - not surprisingly Donna had forgotten that the coffee was "horrible" and too strong as the sight of the next upward slog had both of us thinking of little else! A nice spot for a coffee! After a lot of rest stops and motivational words from both of us we made it up to the saddle and gazed down over Waun Goch towards the footpath that cut across the side of Pen yr Allt Uchaf and lead down towards the valley, and more importantly the car - the end was in sight! The path down across the mountainside was well surfaced but seemed to go on for ever but I think that was more to do with our rapidly decreasing energy levels than anything else. We made it back to the car just as the rain drops started to fall - just under 12 miles took us 7hr12min and we'd climbed a total of 1,237m and were both, it's fair to say, knackered! So we headed back off to the campsite which luckily was only a short, 20min, drive away for a much needed beer! I think that this was was/is probably my favourite so far and certainly its been my best walk in the UK in terms of; weather, views and the lack of anyone else around you - how different it would have been had we headed to Snowdon or one of the other, more popular, area's of Snowdon this weekend. It just shows that taking a little time to research and plan a route thats off the beaten track can have some wonderful benefits and will enable you to get much more out of the amazing country and scenery that we are lucky to have on our doorsteps in the UK.